For decades, Israel has wanted to clear a large section of the West Bank of several thousand Bedouins to make room for Jewish settlements. The herders are being herded. Any day now, the Israeli Army says, bulldozers will arrive to wipe the West Bank Bedouin community of Khan al-Ahmar off the map. For decades, Israel has wanted to clear a large section of the West Bank of several thousand Bedouins — who raise sheep and goats in the creases of the hills east of Jerusalem — to make room for the expansion of Jewish settlements. After an ugly televised eviction in the late 1990s, when soldiers hauled off families and bulldozers leveled a whole neighborhood, displaying the occupation’s brute force, liberal Israeli judges and foreign diplomats helped slow the expulsions. Nothing was stopped, but much was stalled — again and again. The army issued scores of demolition orders for the Bedouins’ rickety hovels of corrugated tin, scrap wood and nylon fabric. Periodically, soldiers tore down a few shacks, toppled water tanks, carted off solar panels or staged military training exercises on the site, in what critics called a drip-drip campaign to make life so miserable that residents would simply leave. But the army did not dare demolish an entire village again. Now, however, the brakes may be off. With the Trump administration providing diplomatic cover, right-wing ministers in Israel pressing to exploit that while it lasts and international support for the Palestinians focused for the moment on Gaza, a new ruling by a settler-majority panel of Israel’s Supreme Court appears to have freed the government to proceed with the removal of entire Bedouin communities on the West Bank. Advocates of the Bedouins say this would be a war crime: the forced transfer of a population under the protection of the military occupation. Khan al-Ahmar is a dusty dot on the map, tucked behind a highway dividing two bustling Israeli settlements: Maale Adumim, so well-established as a suburb of Jerusalem that even leftists concede it would need to be carved out of a future Palestinian state; and a fast-growing offshoot, Kfar Adumim. Bedouins have made the place their year-round home since at least the 1970s, though some, like Mr. Abu Khamis, say they were born there even earlier. Their tribe, the Jahalin, had wandered the Negev desert until being expelled by Israel after its establishment in 1948. When they arrived here in what was the uninhabited West Bank, the area was under Jordan’s control. With Israel’s victory in the Six-Day War in 1967, the army took over, restricted the herders’ movements and expropriated the area as state land — without yet evicting the Bedouins. In the 1970s, the developers of Maale Adumim called for evacuating the Bedouins to build Jewish housing to the east and “cut off the Arab settlement continuity between Judea and Samaria,” the terms Israelis use to refer to the northern and southern halves of the West Bank. With the start of the Oslo peace process in the 1990s, the Bedouins’ presence took on great geopolitical significance: If Israel were to develop the area, as the government has long threatened, it would bolster Maale Adumim’s contiguity with greater Jerusalem. But it would also effectively slice the West Bank into pieces, isolating Arab East Jerusalem and dividing Ramallah in the north from Bethlehem in the south — leaving a future Palestinian state to try to stitch itself together with tunnels or bridges through Israeli territory. In effect, the Bedouins’ presence signals that the status quo is intact: As long as they are there, Israel must first clear them out before it can build, while the Palestinians can point to the Bedouins as place-holders for an eventual state. To a first-time visitor, the village does not look like the contested linchpin of two dueling national destinies. It does not even look like much of a village. Without a jeep or a horse, visitors to Khan al-Ahmar pull over across Route 1, dodge speeding cars on foot, hurdle a metal barrier and climb a rocky hill. There are no electrical lines or water mains. A few feet up is the open-air home of Faisal Abu Dayhok, 45, his wife, their six children and 16 ewes and rams that share a cramped corral the size of a two-car garage. A few feet farther is the school attended by the family’s four youngest children and about 150 other students from Khan al-Ahmar and several Bedouin villages nearby. Built in 2009 by an Italian organization out of mud and used tires, both materials plentiful and cheap, the “tire school” made it safe for local children to walk to class, after several had been struck by cars commuting to schools in Jericho. But settlers in Kfar Adumim and an advocacy group called Regavim perceived it as a threat, said Shlomo Lecker, the Bedouins’ longtime lawyer. Regavim, borrowing the tactics that opponents like Peace Now have used against illegal Jewish outposts on the West Bank, pursued a simple argument in the courts: The law is the law. No one disputed that the Bedouins’ buildings, including the school, had been erected without permits. But critics say that is the reasonable-sounding bottom line to a Kafkaesque deduction: For building permits to be granted, a village must have an approved master zoning plan, and Israel almost never approves Palestinian applications for either. In the past, Israel’s Supreme Court tended to delay the day of reckoning for Bedouin communities, often by questioning whether the government was offering an adequate new home for the residents and their herds. 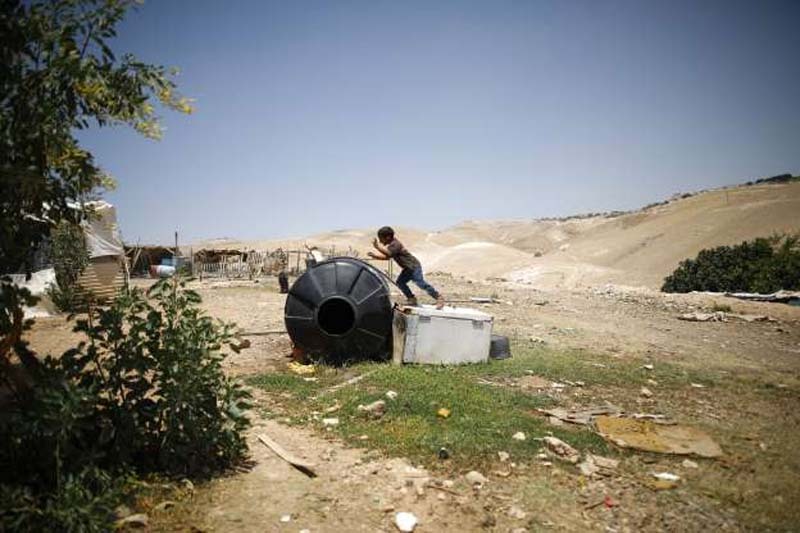 The Khan al-Ahmar Bedouins, for example, are to be moved to a cramped spot called Jahalin West, just outside Abu Dis — an urban setting, near an old garbage dump, with no room for their herds. Israel says Khan al-Ahmar is not only illegal but also unsafe, because of its proximity to Route 1, and the alternative — free plots with water and electrical hookups — will be a marked improvement. “The State of Israel will build a new, modern school at its own expense, which will be of significantly better quality than today’s structure,” said Assaf Zohar, a Defense Ministry spokesman. Yet the new site offers only one-16th of an acre for each family — a fraction of what Bedouins from the tribe were granted in the late 1990s when they were displaced by the expansion of Maale Adumim. Oddly, the Supreme Court’s ruling claimed that there would be a place for their herds to graze — though the government had already acknowledged the opposite. Some settlers have been stricken with remorse: A group of Kfar Adumim residents broke with those pushing for demolition and asked the court to require a negotiated settlement. One, Sallai Meridor, a former Israeli ambassador to the United States, wrote an anguished open letter to his neighbors. Yet the government pressed on. Days after the ruling, approval was granted for a new 92-home neighborhood of Kfar Adumim a half-mile from Khan al-Ahmar. Some of his former neighbors have gone back to illegal homes in the hills, Mr. Abu Khalil said. Others would like to. In Khan al-Ahmar, Mr. Abu Khamis says that the Israeli proposal has a fatal flaw: The Palestinian owners of record in Jahalin West — who do not recognize Israel’s confiscation of their property — have threatened to sue, in Palestinian court, to prevent the Khan al-Ahmar Bedouins from moving in. All of which leaves Mr. Abu Khamis worrying that his neighbors will soon have no place to live.